"When he returned home, he would go straight into the living room, which meant on most days I would not see my father at all." "Just after I graduated from Waseda University, he sent me a cable: 'your father has been looking for a wife for you. What sort of woman do you have in mind for a wife?' Less than three years later, I married his daughter." "He was very strict with us at school. I had to get up at 5 o'clock every morning and help clean the rooms and the garden." "He was so proud of his legs he used to pull up his hakama just to show off his big calves." "He wept when he heard of my sister's (his daughter's) death." When Jigoro Kano was born on Oct. 28, 1860, Japan's feudal period was rapidly drawing to a close. Across the seas in America, the United States was embarked on a tragic civil war. Just as today, it was a time of turmoil and change around the world. He was fortunate enough to be born into a family that was reasonably well off, at least well enough placed to get Jigoro into the elite Tokyo Imperial University. His grandfather had launched the family into the business of making sake in Nada, Shiga Prefecture, near the Biwa Lake in central Japan. In fact, it was this same sake-brewing clan that organized the other sake makers in the area to help finance the Fujimi-cho Dojo that served as the Kodokan in the latter half of the 1880s. The third son in a family of three boys and two girls, young Jigoro was physically weak in his early years. In fact, he was beaten up sooften by local bullies he resolved to strengthen himself the best way he could. It was this unrelenting drive to learn how to defend himself that eventually led to his formulation of Judo. One wonders what would have happened had Jigoro Kano been a big brute of a man instead of the 5-foot, 2-inch, 90-pound weakling he was in his teens. Jigoro enrolled the following year at Tokyo Imperial University at the age of 18. When he wasn't in class or studying, he would go off in search of an osteopath because they had all received jujitsu training. Apparently, he was still obsessed with the desire to learn the art of manly self-defense and concluded ju-jitsu offered him the best hope. His search finally led him to the door of a bone doctor in Nihonbashi named Teinosuke Yagi who promised to introduce him to a jujitsu teacher living in the neighborhood. Jigoro Kano had actually started his training in jujitsu at the age of 17, but his instructor, Ryuji Katagiri, felt he was too young for serious training. As a result, Katagiri gave him only a few formal exercises for study and let it go at that. The determined young man was not about to be put off so easily, however, and finally wound up at the dojo of Hachinosuke Fukuda, a master in the Tenshin-Shinyo School of Ju-Jitsu who had been recommended by Dr. Yagi. Fukuda stressed technique over formal exercises, or kata. His method was to give an explanation of the exercises, but to concentrate on free-style fighting in practice sessions. Jigoro Kano's emphasis on "randori" in Judo undoubtedly found its beginnings here under Fukuda's influence. The Kodokan's procedure of teaching beginners the basis of Judo, then having them engage in randori and only after they had attained a certain level of proficiency, teaching them the formal kata, came from Fukuda and a later sensei named Iikubo. In 1879, a year after Jigoro started working out at Fukuda's dojo, the jujitsu master suddenly became gravely ill and died at the age of only 52. The 19-year-old youth soon joined another branch of the Tenshin-Shinyo-ryu run by a 62-year-old ju-jitsu instructor named Masatomo Iso. Located in the Kanda section of Tokyo near the center of the city, Iso's dojo was known for its excellence in kata. Iso, himself, was only 5 feet tall, but had a powerful body and an energetic personality. Over the next two years, Jigoro Kano ate, drank and slept ju-jitsu, practicing night and day at the point of exhaustion. Things got so bad he was even having nightmares about the martial art, shouting ju-jitsu terms in his sleep and kicking out at his quilt. The sensei saw his dedication and promise and soon made him an assistant. Jigoro instructed 20 or 30 students, starting with kata and then moving on to free fighting. By the time he was 21 years old in 1881, Kano had become a master in Tenjin-shinyo-ryu ju-jitsu. But Iso, like Fukuda before him, became ill and Kano decided to move on, feeling he still had much to learn and wanting to study rather than teach. The next step seemed almost inevitable. Jigoro Kano met Tsunetoshi Iikubo, master of the Kito School of Ju-Jitsu, and began training at his dojo. Even when no one else showed up, Kano would work out alone. Like Fukuda, Iikubo put the stress on free fighting and he was especially skillful at teaching nage-waza. It was during these early ju-jitsu training days Jigoro Kano worked out some new throws and turned his attention more and more to ways of reforming ju-jitsu into some kind of new system. While practicing at the Tenshin-Shinyo Training Hall, he ran up against a big, 200-pound bruiser named Kenkichi Fukushima. Outweighed by 100 pounds, the lightweight youth invariably lost to the bigger man. He wanted to beat Fukushima so badly he could taste it, studying everything he could get his hands on -- books on sumo techniques, training books from abroad, etc. The original idea was merely to reform ju-jitsu rather than found a new system. Kano was well aware of the shortcomings, but felt these could be weeded out with the result that ju-jitsu could be beneficial to young men -- not only as a martial art, but also as a form of physical education as well as training and discipline of the spirit; in short, a valuable preparation for one's daily life. He dedicated himself to formulating a system of reformed jujitsu founded on scientific principles, integrating combat training with mental and physical education. He borrowed the "katamewaza" (mat techniques) and "atemi-waza" (throwing techniques) of Kito-ryu, holding onto those techniques that conformed to scientific principles and rejecting all others. All harmful and dangerous techniques were eliminated. Much has been written about those early days at Eishoji, and it is this temple that is generally regarded by most people as the birthplace of Judo. The transition from jujitsu to Judo was made slowly but surely, although it is difficult to pinpoint the day when what that handful of students were learning was no longer ju-jitsu, but Judo. It might have been the day when Kano first defeated Iikubo. Until then he had never managed to get the better of the Kito-ryu stylist. But that day in randori practice, Kano blocked every move Iikubo made, then called on his "uki-waza" and "sumi-otoshi" to throw the ju-jitsu master no less than three times. It seems the converted dojo adjoined the main hall of the temple in which the image of Buddha was located together with hundreds of mortuary tablets presented by various worshippers. And every time Jigoro Kano and his students practiced, these clay tablets bounced up and down and banged against each other, several falling to the floor. This went on until one-day head priest Choshumpo rushed into the dojo and declared: "He may be young, but Mr. Kano is really an outstanding man. What a fine person he would be if he would only leave this Judo alone." But 1884 was the key year when the Kodokan by-laws were drawn up. Kano declared, "Taking together all the merits I have acquired from the various schools of ju-jitsu, and adding my own devices and inventions, I have founded a new system for physical culture, mental training and winning contests. This I call Kodokan Judo." Randori and kata became firmly established and even made the subjects of lectures and debates as well as a part of education. But the big difference from jujitsu was the "do" in Judo -- finding the way. Kano saw Judo, then, as a way of life. He saw it in terms of a sport, whereas jujitsu was merely another of the martial arts, a method of defense. The dangerous techniques of jujitsu were eliminated from the Judo contests, but retained as part of Judo's defense system. This especially applied to "atemi waza." As might be expected, a fierce rivalry sprang up between Judo and jujitsu. The martial art had been steadily declining toward the end of the 19th Century and its masters were getting desperate to hold onto their students who were beginning to trickle away to Judo. Kudo says reports of street fighting by Judo and Jujitsu students jealous of their own prowess were exaggerated. These students were Kano's Judo stalwarts in the early contests with the police and other ju-jitsu dojo. The first "shiai" probably started informally in the Kodokan, but by 1884 the first Red and White Contest was inaugurated, continuing biannually until the present day. The following year the Kodokan won its first shiai -- against the police, who had adopted ju-jitsu. "Kagami-Biraki," or Rice-Cake Cutting Ceremony, was instituted in 1884 and has been observed ever since on the second Sunday in January. 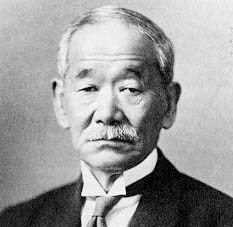 By 1886, Kano changed the Kodokan once again from his home in Koji-machi to the Fujimi-cho residence of the Meiji Era magnate, Baron Yajiro Shinagawa. And it was here during the next three or four years that Kodokan Judo achieved supremacy over the rival ju-jitsu schools. Prof. Kano addressing a group of Judo students at Kodokan promotion ceremony about 1907.Jigoro's feelings about education are summed up in a statement he made at the Kodokan's 50th anniversary in 1934. "Nothing under the sun is greater than education. By educating one person and sending him into the society of his generation, we make a contribution extending a hundred generations to come." It was in August of 1891 Jigoro Kano married Sumako, the eldest daughter of Seisei Takezoe – one time ambassador to Korea. They had nine children -- six daughters and three sons, including Risei, who became head of the Kodokan and the All-Japan Judo Federation. Jigoro Kano teaching uki goshiThose were the days of Meiji (1868-1912) when the father was a benevolent despot, when children were seldom seen and rarely heard, when they were not allowed to venture into the living room if he were there, when they were not allowed to take their meals with him, when they feared and respected rather than loved him and when his commands elicited instant obedience from them. Takasaki also remembers Kano liked sake, but knew his limit and usually stopped before he had too much. "If he over-imbibed, he invariably got sick. Prof. Kano (front row, fourth from left) with several other ju-jitsu masters teaching at the Kodokan in 1921.Nango, 91-year-old nephew of the Shihan (Nango's mother was Kano's elder sister), also learned Judo under Jigoro Kano. He studied Judo for eight years and went as high as nidan. He still remembers doing randori with the Judo master at the "Kano Juku" (dojo). In later years he lent financial support to the Kodokan and continued his close association with Kano right up to the time of his uncle's death. Prof. Kano teaches a woman's self-defense class at the Kodokan. Kano taught kata until a very old age, sometimes demonstrating its techniques with his assistants. His method of teaching Judo varied according to the age and experience of the student. Although he stopped doing randori at a much earlier age, he continued to stress it over kata. His idea was to have the students engage in free practice and assimilate kata naturally. Jigoro Kano at historic moment of 1936 Olympics in Berlin when American Jesse Owens was awarded a gold medal in the decathlon after defeating Germany.As a member of the International Olympic Committee, Kano attended every Olympic Games from the Fifth Olympiad in 1912 in Stockholm to the 1936 Olympics in Berlin, including the 10th Olympiad in Los Angeles in 1932. Kudo asked Kano if Judo should be included in the Olympics and the Shihan replied: "If the IOC asks Japan to include it, then Japan will consider it." In 1913 Jigoro Kano, accompanied by Takasaki and S. Kotani, now international secretary of the Kodokan, went to Geneva to offer Tokyo as the site for the 12th Olympiad in 1940. It turned out to be the Shihan's crowning achievement although a cataclysmic world war was to force its postponement for another quarter of a century. On his way home from that momentous conference on board the SS Hikawa Maru on May 4, 1938, Dr. Jigoro Kano died from pneumonia. He was 78 years old. Another dream, an International Judo Federation, plans for which Kano revealed in 1933, came true in 1952. Today, more than million persons practice Judo in over 200 countries around the world. In October of 1969 thousands of Judo fans watched the sixth World Judo Championships in Mexico City-vivid proof of Jigoro Kano's prophetic statement, "When I die, Kodokan Judo will not die with me because all things can be studied if these principles (best use of energy and mutual prosperity) are studied."